StingRay-Saltwater Pressure System | Products | Headhunter Inc. The Stingray Saltwater Pressure System is designed specifically for continuous duty in the harsh marine environment, and is the perfect solution for saltwater toilet flushing, live bait wells, aquaculture, and anywhere else high flow/pressure salt or fresh water is needed. Featuring an innovative multi-stage impeller system driven by a quiet TEFC motor, the Stingray is able to deliver over 20 GPM and up to 67 psi. 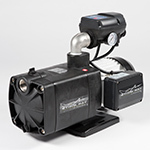 The pre-installed Remora pump control turns the pump on when system pressure drops to 40 psi, and off when the pump reaches a no flow condition, allowing the Stingray to operate with or without a pressure accumulator tank as well as providing dry-run protection. An easy to view control panel with L.E.D. diagnostics and dry run visual alarm makes troubleshooting and system monitoring a breeze. High pressure/high flow continuous duty rated saltwater pressure system with dry run protection. Can be used with or without pressure accumulator tank. Ideal for saltwater washdowns, and live bait wells. The Stingray has been tested and certified to surpass all requirements of Underwriters Laboratories UL 778 specifications for Motor Operated Pumps. The Stingray is CE approved.